Within your life span, you've had your fair share of tasty turkeys on thanksgiving. Some bigger than others, some crispier than others but there is a new turkey invention that will blow your mind and well, if you're an animal lover, your might not want to look. 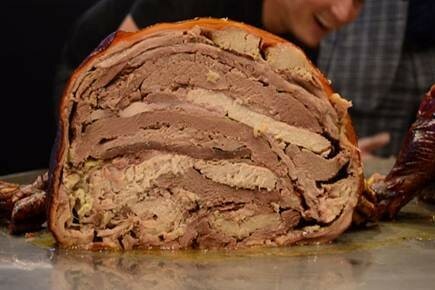 The hosts of an australian radio show called Merrick & The Highway Patrol decided to cripple the three-fold turducken idea with a collage of meat called the turducken ridiculous. The new dish combines a plethora of meat from 20 animals including an emu, kangaroo, camel and rabbit. 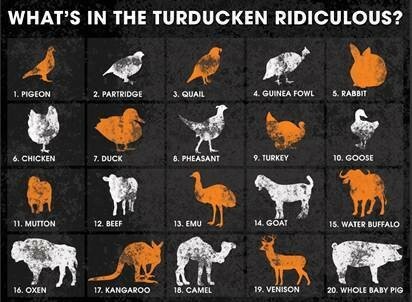 If you love your meat and want to do something wild this thanksgiving, this may be the answer. But beware, it will probably give you a food hangover for the rest of the month. Eat up Bend.